Milbocker & Sons, Inc. is experienced in installing steel sheet piling, and has also installed vinyl sheets to serve as effective support structures and retention barriers. Sheet piling is an earth retention support technology to retain soil by using interlocking steel, vinyl, or wood sheet sections. 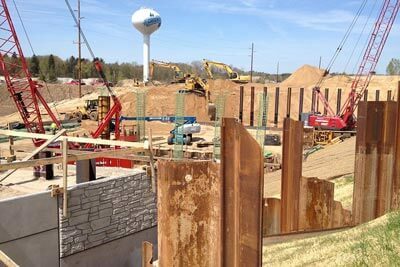 Sheet piles are installed sequentially to a designated depth along a predetermined perimeter. Due to the interlocking sheet piles, they do not only provide to retain soil, they can provide lateral earth support, slope stabilization, and reduce groundwater flow. Vibratory hammers are used to install sheet piles. If soils are too hard or dense, an impact hammer can be used to complete the installation. At certain sites where vibrations are a concern, the sheets can be hydraulically pushed into the ground. For more information on Milbocker & Sons, Inc. professional steel sheeting and piling services, or to request a quote, contact us here or call us directly at (269) 673-2195.